Cascade concrete. Sierra cement. West Coast skiers have endearing nicknames for the moisture-laden snow that doesn’t ski like champagne powder but can come down in fountains. While the northeast sees every imaginable kind of winter precipitation, our mountains tend to get icy before they get heavy. Not this past week. Now we’ve earned our own coinage: Adirondack Asphalt. Winter Storm Damon was touch-and-go for much of the region as sleet, ice, freezing rain, and plain old rain foiled the hopes for a 100% snow event. Luckily, on our side of Lake Champlain, the Adirondack High Peaks stayed almost entirely snow to the tune of two feet. That was enough to make it open season on the backcountry, but given the midweek timing I pulled into the High Peaks with barely a car in sight. The ranger informed me there was a lone snowshoer heading toward Algonquin, the route to the Wright Ski Trail, which is marked for skiers only. In other words, fresh tracks. Or so I thought. While I was lucky enough to spend family vacations skiing this kind of snow at Whistler, I hadn’t contended with this stuff going uphill before I adopted backcountry touring as my winter sport of choice. Breaking trail was akin to churning through a cement mixer as a couple-mile trail gaining 1,700’ took three hours when I could normally do it in half. My skis weren’t visible above the snow at times and I put up my heel risers even on flat stretches to keep my boots afloat. I caught the snowshoer’s broken trail, which helped a bit, and eventually the snowshoer himself, an affable Québecois day-tripper. He shared some duct tape as the heavy snow had gummed up my climbing skins, which were hanging limply from my skis. It was an early season mistake not to have brought some backcountry repair essentials. 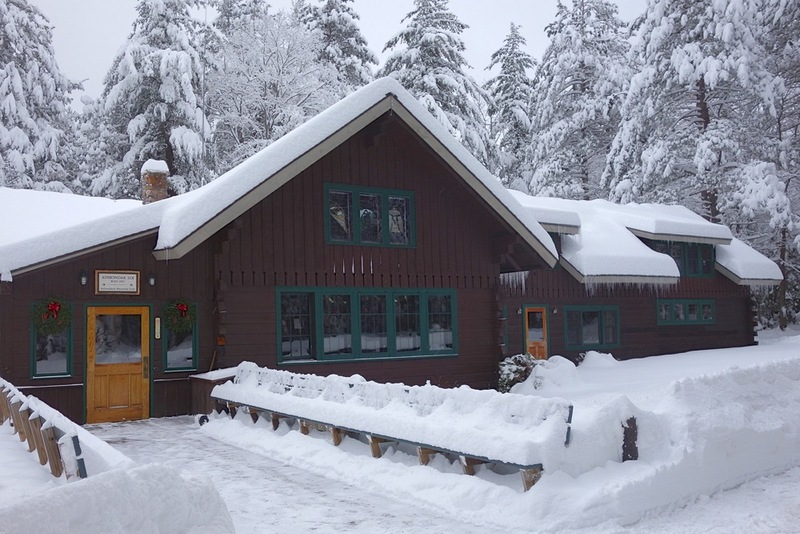 By the time I got to the base of the Wright Ski Trail, a 1930s classic designed by Dartmouth ski coach Otto Schniebs and the likes of which the Adirondack Powder Skiers Association (APSA) hopes to replicate, I was gassed. A dawn patrol at Whiteface — which yielded a surprisingly light and fast powder stash on The Follies — made the afternoon’s work all the more taxing. As a solo traveler with daylight fading in these shortest days of the year, I reluctantly but prudently abandoned my objective despite the untouched line above me. Coming down was, frankly, more work and drudgery as the rain crust buried in the middle made for slow going even with gravity’s help. The upshot was that this layer is an excellent, stable base for resorts and backcountry areas alike, especially avalanche-prone terrain like the High Peaks’ slides. According to the calendar it isn’t even winter yet, so I’m hoping this storm was a down payment on the upcoming season and my travails a sacrifice for the greater good. Asphalt ? That’s called powder around here. Great to hear about High Peaks BC here on the Harvey Road. Well played and nicely written. That snow sounds very familiar. The Wright Peak Ski Trail was not cut by the CCC. keith — noted and corrected. 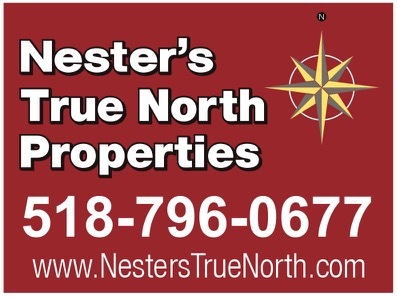 thanks for keeping us on our toes! With that particular snowpack while breaking trail, I found it helpful — my binds were sinking deep into the snow while my tips remained closer to the surface. On reflection I was also traveling gradually uphill even if there were flat stretches. Does the Wright Ski Trail include the slide on the NE face of Wright Peak (see link above – I hope it works)? I will be in Lake Placid next week and I hope to do a tour with maybe a few downhill turns from the Loj if the conditions allow. Any recommendations for maps or guide books? It does not. 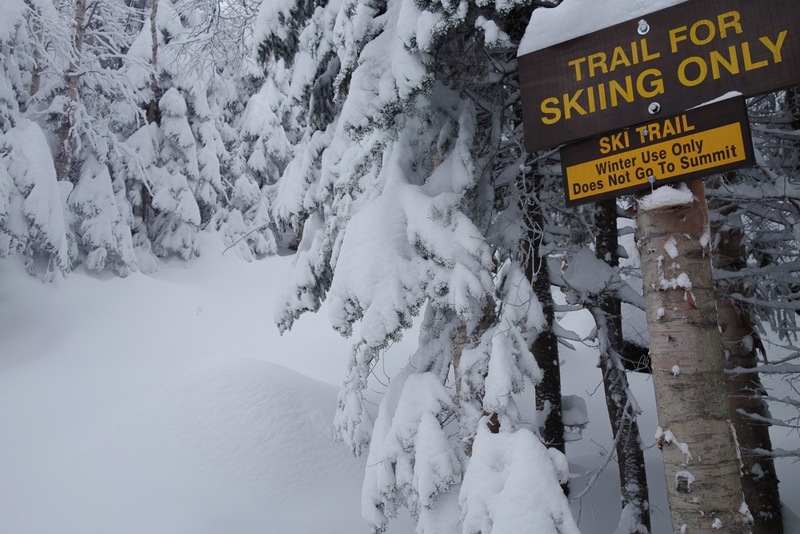 The Wright Ski Trail is marked by ADK trail signs and blazes. It’s a narrow run — classic NY/New England skiing but tight turns. The slides are “natural” trails with no blazes or signage; you have to bushwhack to get to them, generally. Drew Haas’ Adirondack Slide Guide is your best resource. Note that avalanche training and gear is highly recommended for any slide skiing. 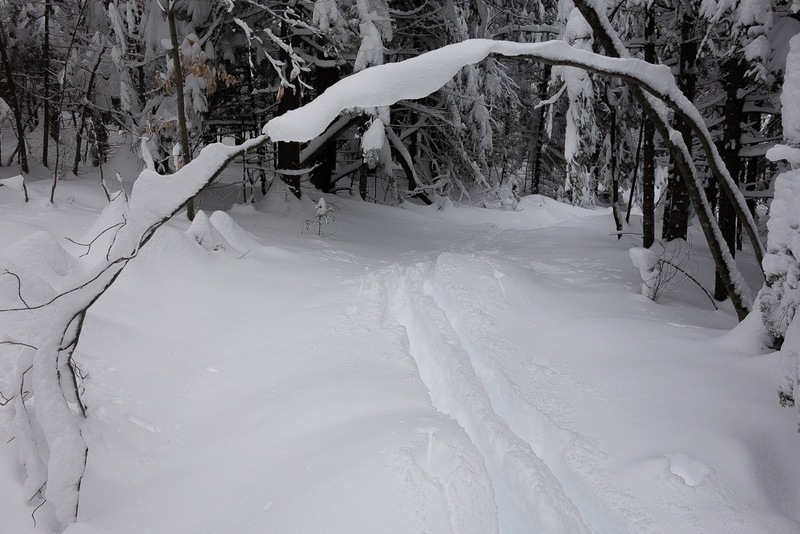 For trails like the Wright, check out David Goodman’s Best Backcountry Skiing in the Northeast. And finally, http://www.jackrabbittrail.org/conditions will be your best bet for conditions. They will be able to assess whether the trail is still skiable after the rainstorm.